and is ready to go! After exploring pictures on the internet I noticed a common thread with Bistro tables. They are simple, have a tablecloth and always have a floral arrangement. I used these black dinner plates like a charger to separate the checkered pattern on the table from the dishes. My Pottery Barn napkin rings were used to casually gather the napkins. I love the box and plan to keep it! Liz this turned out really cute!!! Love the dishes and believe it or not I bought the very same glassware!! I've been collecting bee things since I bought that bee pillow and rug for my family room. They look great with your new dishes!! I love the table! 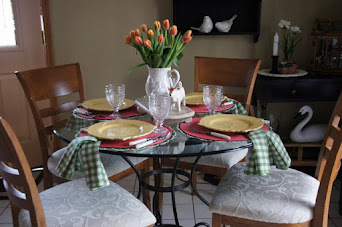 Liz, Your table is so cheerful and love the red and white checks and your stemware. Pretty!! It's good that your flowers are still blooming. We have cooler temps and our roses and gardenias are starting to bloom again. The french bistro look is charming. The new dishes are so cute. Your flower centerpiece is so pretty and freshly picked from your garden. 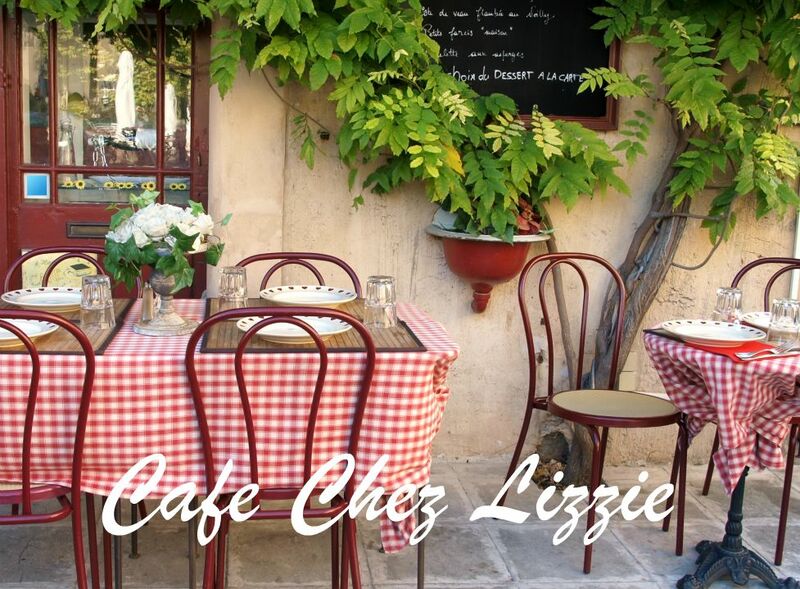 Love the Cafe Chez Lizzie name....Even, the box matches. What a charming table setting! And I love the box that the dishes came in. How cute! 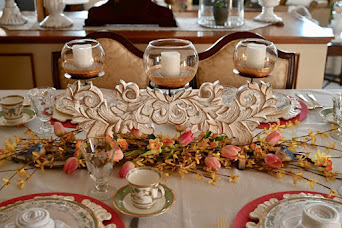 Welcome back to the wonderful world of tablescaping, Miss Liz! You've come back with a barn burner!!! Wow...I love, love, love the dishes!!! They really do look like something you'd see in a fine bistro! I really like the tablecloth, too. That wide swath of darker checks really makes it stand out! This would make eating croissants and sipping cafe au lait even more special!!! Beautiful! You captured the bistro look! You new set of dishes spells c-h-a-r-m to me! What a cute table this all makes. I'd save that box too. You can use it for more than just storage. What a beautiful location for morning coffee. 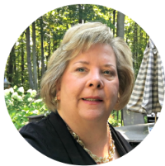 You've created such an inviting space, Liz! I only have a breakfast island and a formal dining room table, and I would LOVE to have a space like this. What a wonderful table. I just love this simple look. Your flower arrangement is beautiful. Things are really fading away in my garden so it is nice to know there are things blooming somewhere. Just love your new dishes and your glasses. Charming! I love it when I find a new blog to add to my sidebar. Everything is fantastic... Thank you so much for visiting My Cozy Corner. 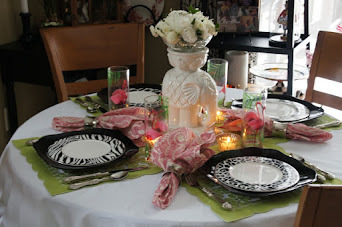 Oh how I love this tablescape. So perfect I want to be there! That is surely a Summer Fun table! Love your dishes and the checks are so cheerful! I love the tablecloth! Thanks for joining the party, Liz! This was a great entry to Let's Dish! Oh Liz this is so charming! The manual setting was a great idea and I would save that box also. Thanks for visiting Pandora's Box - love your table with all the red checks! And your flowers are so bright and cheery! Love it Liz! 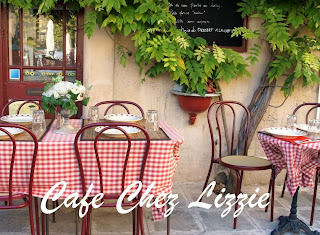 Such a cute bistro setting. When I looked at the vase holding your flowers I immediately thought of the Eiffel Tower! I have the same stemware. Aren't they the most versatile stemware. I love them and use them all the time! Have a wonderful weekend. Liz, those bistro dishes are lovely! 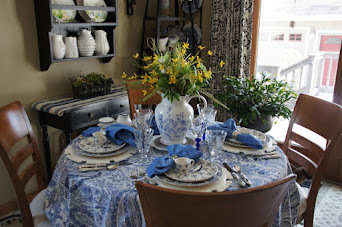 I live the box they came in too :-) The bistro table looks great with the checked table cloth. Thanks for your visit and for becoming my newest follower. 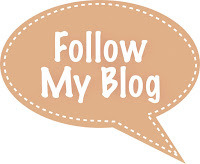 I am happy to follow back. I just noticed my typo. That should be love, not live. Vry pretty Bistro setting in that lovely little table. I love how the bistro dishes came in that cute tin box. Love the back plates, they really pop up! Thank you for your lovely and sweet visit darling Liz, I just love it when youd do. Enjoy your weekend. Ooh La La! Charming table. I love that box too and I would save it as well. I am your newest follower. Stop by for a visit when you have a chance. Oh my, I love this table and everything on it. You surely captured the bistro feel. The dishes are above awesome and I have some of the stemware and just love it. The tablecloth, napkins, chargers and everything...perfect. Great new china and the red stripe is lovely. I like your bistro table with the red tablecloth. You so fortunate to have pretty flowers from your garden to grace your tablescape! The photos are beautiful with the different light! I love the new china! and red checked tablecloths are always a favorite! What a simple, beautiful table! When do we eat? Lovely breakfast table! Very cute dishes, and you have displayed them beautifully. Very pretty stemware! I'd like some French toast, s'il vous plaît! I love gingham checks Liz. Your bistro table is perfection! in Italy we use tablecloth and cloth napkins everyday. 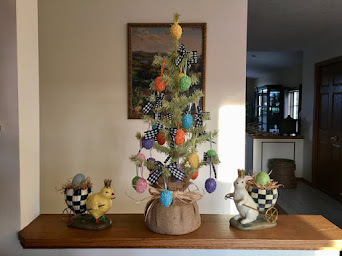 The checkered pattern reminds me of my chilcdhood, when I would help set the table! I like the simplicity and beauty of it!